Heidi’s Beer Haus sounds like the sort of place a serious drinker might like to frequent and perhaps somewhere in Germany such a bar exists; in this case however it’s the name of an online slot machine from WMS Gaming with a generous number of reels and free spins on offer – find out how it all works below. 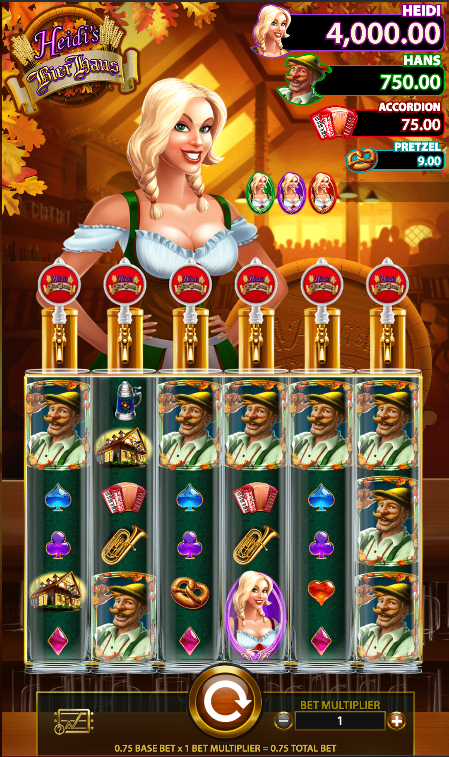 Heidi’s Beer haus is a six reel slot with six rows and twenty five fixed paylines; each reel is an elongated beer glass underneath a tap presided by Heidi in her traditional Bavarian outfit. The huge beer hall stretches away into the sunny distance. There are plenty of theme-related symbols including a happy drinker (Hans), the pub itself, a metal stein, an accordion, a trumpet, a traditional hat and a pretzel; playing cards symbols make up the lower values. The wild symbol is a glass of beer which will replace all others to form winning combos except for the green purple and red Heidi icons. Before any base game spin Heidi will operate the tap above the reels and fill up to six of the glasses with beer – these act as wild symbols for the next spin. This is triggered by landing three of more Heidis anywhere in view but note that red Heidi only appears on reel four and that reel six only contains green Heidis, purple Heidis and Hans. 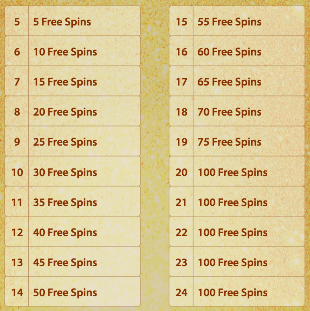 It’s possible to land lots of Heidis on one spin and the following table shows the number of spins awarded for the number of scatters landed. More spins can be won during this round by landing more Heidis again and the Tapper Wilds are also active. If you were lucky enough to trigger the spins with a red Heidi on reel four then you’ll get to spin a Wheel of Fortune which will award one of the cash prizes displayed above the reels and/or some extra free spins. A purple Heidi in the triggering spin will lock in place as a wild for the entire round and a random Wild Hans spin will add up to ten extra wilds to the reels. Heidi’s Beer Haus is a little unusual and a little complicated to boot but once you’ve got your head around the various bonus features it’s an enjoyable slot to play with some nice variation and pub-like sound effects. It comes with an RTP of 96.13%.